Why are KSB Seals Better? A high-quality mechanical seal that is fast to replace, competitively priced, and customized for the application is crucial for trouble-free pump operation. KSB’s direct retrofit program offers high-quality mechanical seals, manufactured by industry leader Burgmann, that can be installed quickly and easily without requiring any adjustments. The robust and wear-resistant design of the single seals results in long service life and low maintenance costs. The tandem arrangement (with a common oil chamber) offers a 100% backup seal to provide dry run capability. Standard “off the shelf” mechanical seals by Burgmann provide easy availability to a quality product from a well-known brand. Silicon carbide is the best seal face on the market with no binding, long life, and it does not require a shaft sleeve. The silicon carbide seals have a surface hardness of 2700 Vickers, compared with the next best material, Tungsten Carbide, which has a hardness of 1500 Vickers. The harder surfaces are more resistant to abrasion wear, resulting in longer life. Silicone carbide has a superior thermal conductivity. This allows the seal face to dissipate heat more efficiently to the surrounding pumpage, allowing the seals to run cooler. They can better maintain the water film’s viscosity between the seal faces. This allows the seals to be more resistant to dry running. 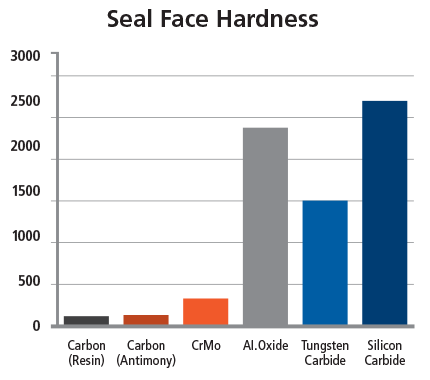 Silicon Carbide seals have the best resistance to chemical attack.